*Shipping costs included, US and Canadian tax rates excluded. The actual prices depend on the current gold price and excange rates. **Shipping costs excluded, Dutch BTW included. The actual prices depends on the current gold price. Migiziwag, the American Bald Eagles with their white heads and characterisic yellow beaks, have always been considered sacred beings by the Anishinaabe Peoples. Migizi miigwanag, the feathers of the Bald Eagle, are viewed sacred in themselves, and therefore honored with great care and shown the deepest respect. 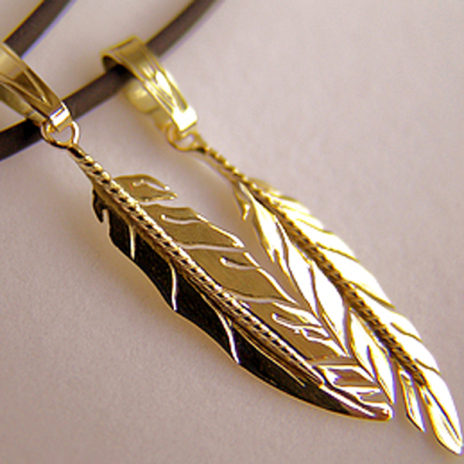 These gold feather wedding pendants are symbolic of ojichaag bimisewin or ‘Spirit Flight’: the spiritual journeys the human mind is capable of - a special and often elusive dimension in our existence. 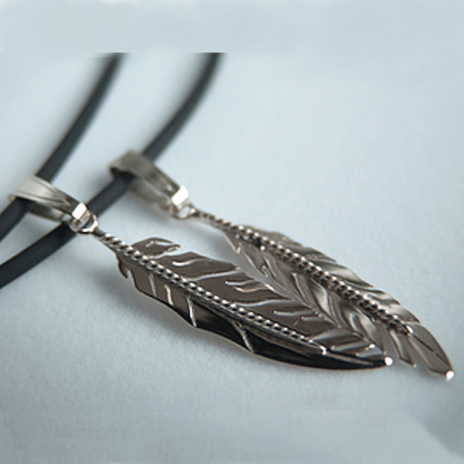 The elegant shape of the gold feathers suggests "movement" or "flight". 'Spirit Flight' allows a person, or a couple, to see from high above the sacred path they walk on earth.